Equipping your office with the right fire fighting equipment is critical. Even if your office is part of a larger office complex, it’s important that there is fire deterrent in your own office area. It is possible that the office-wide fire security system does not extend to your own premises or you have sensitive equipment that must be dealt with carefully. Fire safety equipment involves more than just fire extinguishers and you may want a more comprehensive system. In that case, you should check if the fire safety extinguishers suppliers offers other fire fighting equipment like fire blankets and fire alarms. You can choose to go with a separate vendors or manufacturers, but a single vendor is more likely to give you competitive pricing apart from saving your time and effort. Every office has some risk factors. These are the accelerants and the people in a given area. The more the people, the increased are the chances of chaos and confusion on evacuation. The layout of the office and the distribution of people should be considered. The layout of the office is particularly useful in forming an exit plan and to assess how a fire can spread and be contained. The other risk factors are posed by the equipment and other materials stocked in the office, some of which might be extremely flammable. For instance, any fuel kept in office must be carefully recorded and their location specified. Similarly, sensitive equipment like electronics and important documents must be taken note of. The type of material will also decide the type of extinguisher you need. You can also contact a fire safety expert to evaluate the safety measures present and required. Assessing the risk will also help you in identifying the number of extinguishers you need and where these should be placed. 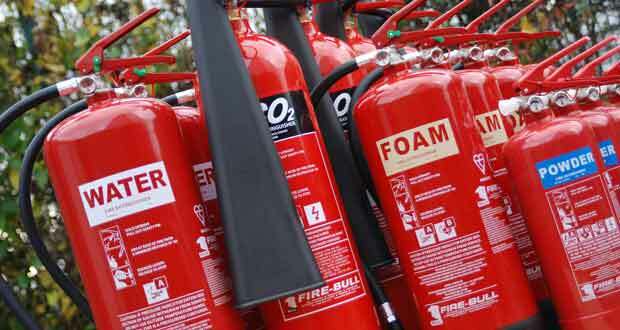 Before you look for a fire safety extinguishers suppliers, identify the right location for the equipment. This must be at an easily accessible place. You can keep an extinguisher in every room, but if you are planning on a common extinguisher, ensure that it is kept at a common area. It should be kept away from a flammable objects. Follow your risk assessment in deciding the placement of extinguisher, making sure that high risk areas have at least one extinguisher. Water extinguishers: Effective against solid materials such as paper, wood and textiles. ABC Dry Powder: Effective against fires involving flammable gases. Foam extinguishers: Effective against flammable liquids like petrol and solids like wood and paper. Carbon dioxide fire extinguishers: Effective against fires involving electrical equipment, like computers. Wet chemical extinguishers: Effective against fires involving cooking oils and fats. So, evaluate the kind of equipment and inventory you have in the office and decide the type of extinguisher accordingly. For instance, the computer server room will require a CO2 extinguisher, but a room with flammable liquids will require a foam or dry powder extinguisher. This requirement must be assessed carefully before you make the call. It is important to see what kind of services the supplier is offering. Extinguishers need regular servicing. So, any supplier who also has a servicing facility wins brownie points. See if you can get a favorable deal along with your extinguisher. Many suppliers offer complimentary service for a limited period. This should also be considered in the overall pricing. Selecting the right fire safety extinguishers supplier has a direct impact on your own safety parameters. So, consider all these factors carefully before taking selecting the right supplier.